To make your appointment as smooth as possible, we’d like to go over what you should expect when you come in to the Pediatric ENT Associates clinic. You and your child are of the utmost importance to us, and we want to make sure you are prepared and comfortable. When visiting our clinic, you should allow at least two hours for the appointment, and know that there may be delays. We know your time is important to you, so we’d like to explain some common reasons for delays. Children with chronic ear problems may need to have their hearing evaluated, an ear procedure done such as ear wax removal or ear suctioning, or have an ear culture taken. 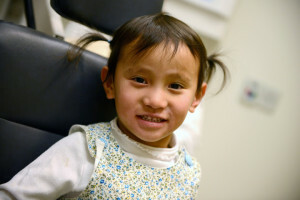 In addition, if surgery is scheduled, pre- and post-operative teaching may be given to you and your child. In the case of post-operative visits, maintenance may be done such as suture or packing removal and changing of dressings. Your Children Deserve the Best Care Possible. If your child has croup, stridor, or other voice related problems, they will be evaluated by a physician or nurse practitioner and may need further scope testing, which requires the use of special equipment. Airway x-rays or other diagnostic tests may be performed as well, and any special diagnosis of the voice box will be explained in detail. Children suffering from chronic strep throat may require surgery, which will need to be scheduled after a thorough evaluation by a physician or nurse practitioner. Other reasons for delay include having to work in emergency patients, and doctors being delayed in the operating room or needing to perform emergency surgery. You will be informed of the reason for any delay, and we appreciate your understanding and patience. Please remember to bring any necessary forms to your appointment, and don’t forget your work or school excuse and medication list on the way out. In addition, we may need to schedule follow-up appointments or surgery. To make an appointment, please call Pediatric ENT Associates at (205) 831-0101! For your convenience, please fill out the form below to schedule an appointment. A member of our team will contact you to confirm your desired day and time or offer an alternative day and time that accommodates your schedule.